Since I got my Smart TV a year back, I have found myself consuming more multimedia content from Internet on my television set as compared to from my cable provider. And, it would have been even more if my internet connection speeds would have allowed it. Even so, I like seeing videos (even in low quality) on my Television set, because I have full control over what I am watching, rather than being at the mercy of various Television channels. And, it is not that I am missing on any fun from the traditional channels, because as you can see from the screenshot below, most of them are already available on Youtube. Literally all serials and shows come up on Youtube two or three hours after they are beamed on television. There are infinite more choices and channels on Youtube, than what DTH provides. But I do understand that I am part of minority, where less than 10 percent Indians have broadband internet and even lesser have TVs that can beam Youtube on it! But that may soon change, if what Google is planning to do becomes a reality. 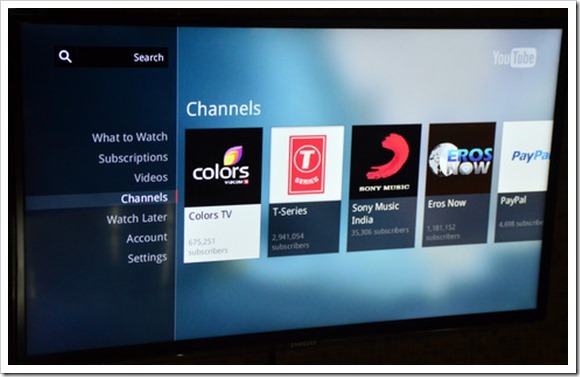 According to a ET report, Google is in talks with DTH cable providers to bring Youtube on television screens. This will be a significant development if it goes through! While the report does not give any further details on this, it is suffice to say that if Youtube can be watched through your DTH provider without a need of an internet connection, the usage of Youtube will suddenly grow multifold in India. It all depends on how much control users will have on Youtube via their DTH providers. If the viewers can even partially search videos from Youtube and watch them on their television, the TRPs for “Youtube Channel” may go through the roof and probably more than anyone else! Recently, Rajan Anandan, Google’s India chief made an interesting revelation, he has said “Today we have 10,000 full-length Indian movies on YouTube and 95% of India’s music catalogue both in Hindi as well as regional is available on YouTube.” Even as of today, 6 billion hours of videos are watched on Youtube each month and about 100 hours of video are uploaded to the service every minute. With that kind of catalogue, a viewer may hardly need anything else! There is no doubt that if Youtube can be watched through your traditional DTH or cable provider, it will usher a new era in Television viewing! The movie list that Rajan Anandan, Google’s India chief is talking about is very old and most of us have watched it on TV since we were born.